Sticky residue on scalp is mostly caused by product build-up on oily hair type people. The residue is caused by styling products and conditioners and it get sticky because it get mixed with scalp sebum (excess natural oil produced by your scalp). Normally it won’t go away with regular shampoo and require deep cleansing. A clarifying shampoo with high PH value should help to solve the problem and it should only be used once or twice a week followed by a light conditioner to restore the moisture back to hair. 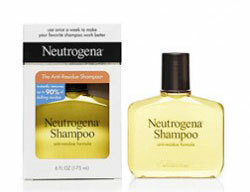 You should continue using your favorite shampoo and use Neutrogena Anti-Residue only to cleanse your scalp once a week. Thank you all for your help! I had this problem many years ago when my kids were young. I chalked it up to chlorene from the pool, perming my hair, and there was always the nagging thought that I overly conditioned my thin and limp hair. Not true, by the way. Last week I had my hair colored at the salon I have been going to for a few years. Something was different this time. I think she used a different conditioner, or maybe a different hdye product as well. My hair was not shiny and silky as is its usual texture. The next day after washing it I noticed how awful it felt The best way I can describe it as is a heavy, dull, sticky, filmy residue on my hair. At first it was at the crown of my head. I assumed I didn't rinse the conditioner well. As I continued washing my hair over and over- and using a clarifying shampoo- I was drying out my newly dyed hair but that dang waxy spot now elongated to the rest of my hair. From the ears to my shoulders the greasy looking, disgusting strands of hair were freshly washed and I was embarrassed to leave the house. I tied it up and hid the greasy looking hair I couldn't address. Then I googled it, remembering this happened to me once before. I live in Houston and our fake water supply is very very hard and chemically laden. Since this is the first time this has happened to me since having my hair professionally colored, it can't just be the hard water I have always lived with. It HAS to be the combo of conditioner and product the hairdresser put on my newly dyed hair. I have a call into her to see if she changed the product (s) she used on me. The color is different too. One dimensional and mousey brown. I used Dawn (2X strength because this is what I had on hand) and it worked 98%. My hair is now brittle and dry and I conditioned it today, but that sticky patch is gone. I could tell while shampooing with dish soap that I broke through that build up and residue. I was afraid to use vinegar because I just colored my hair. Dawn worked wonders. Thank you!! Same problem as all these others - sticky hair, mostly in the crown area. My hairdresser couldn't even wash it out. She thinks it's a hormonal thing as one of her other clients has the same problem. I'm 48, pre-menopausal, otherwise healthy. We have rain water tanks, very clean water. I have tried the Neutrogena shampoo. It didn't work. Also vinegar rinse. No luck. Next I'll try dishwashing liquid, with bicarb and vinegar fizz chaser... Let's see how I go! I'll be fragrant, that's for sure. My once full, wavy hair that I only had to wash twice a week has now become flat, and feels like it's coated with oil.. It's not my scalp though, only my hair. I've been having this problem for several months now. I'm thinking it's the frequent use of hair coloring that I use - about everything 3 weeks to cover the gray, so hopefully one of these suggestions will work. I'm using an all natural hair color because I'm very sensitive to chemicals in products. I'm not on any meds and don't really have any health issues but I do color my hair a lot. My hair has become so, so flat and lifeless these last several months and I haven't had any luck with OTC shampoos, more frequent washings, or using vinegar. I also tried the Neutrogena anti residue shampoo once which helped a little. Maybe tomorrow I'll try the the Dawn dish soap. Thanks for the suggestions . At least I know I'm not alone with this problem. Neutrogena Anti Residue shampoo works! I am a 51 y.o. female and experienced my hair becoming sticky/waxy on the crown and increasing in area daily during the past week. I thought one of my kids must have put something in my shampoo. When it just got worse over the following two or three days despite daily shampooing, I knew I had a problem. And I, like you all, am very grateful I found this website. I am also recently experiencing a hormonal change and am going through menopause which is my best guess as to why this occured. The Neutrogena Anti Residue Shampoo worked to remove the waxy buildup in one shampoo. Prior to that, I had tried a shampoo product for psoriasis/excema which contains salicylic acid that had removed quite a bit of the waxy buildup as well. my hair is now wax free, but pretty dry at the ends and I am now putting almond oil on the ends only of my hair before I shampoo to try to restore some of the moisture and manageability and reduce frizz. You can remove the wax with these products so do not worry! It's a weird condition for sure! I moved a new apartment which had the same water source as my last apartment. I had no problem washing my hair at the old place. The very 1st night I took a shower in my new place I had what felt like grease film in my hair. I tried switching shampoos. Even used water at my moms house but it didn't change finally I was at my breaking point in my shower one morning and then it hit me oil spill. They use dawn dish soap to get the oil off the animals cause it strips oil off but leaves their natural oils they need to survive in wild. I jumped out of shower and ran to the kitchen and grabbed it ran back to shower and after I washed my hair with it the 1st time I could feel less of the oil goop in my hair so I washed it again and after 4 washes it was all gone. I try to wash my hair occasionally with regular shampoo but the outcome is always the same. I always end up with end up as soon as I go rinse it with greasy goopy hair and wash it with dawn soap. I don't know what's causing it. But my hair looks healthier than ever and split ends are almost non existing ever since I started using dawn dish soap. I still wish I new what has caused this problem though. Hi Everyone, I have been so upset about my hair lately! I've never had a problem with my hair, and I use absolutely NO hair products. I simply wash, dry, and straiten it! But for the past month it's been a mess. Feels like I have shampoo left in it all the time. It's greasy and sticky, and simply impossible to manage. But what's funny is when I go out of town to my parent's house, it gets better. I thought maybe it could be hard water, but apparently no one in our area is having this problem. So it's just me!?! I'm going to buy this Neutrogena shampoo today, and am REALLY hoping that it works! When I was pregnant I noticed a lot of changes with my hair and scalp. My scalp was oily and had build up that I could not seem to control with my regular shampoo. I did use this and it worked great for me. I used it about twice a week and it really helped.